One of the two fresh cities for Minecraft Bedrock Edition creation of which took quite a long time. On our site there is a wide choice between the completed cities from small towns to giant megacities where you can easily get lost without a map. As for the Mojave Region, it is a simple and very cozy city on the shore. Modern architecture says that the city was built not so long ago. If you look at the city from high, the Mojave Region is not that big and can become a ready platform for MCPE servers with a lot of players. Place yourself in a high-rise, get down for lunch in a cafe and in the evenings just walk and admire the beauty of this city. In parallel to this project there is High Block State which has similarities in some way. 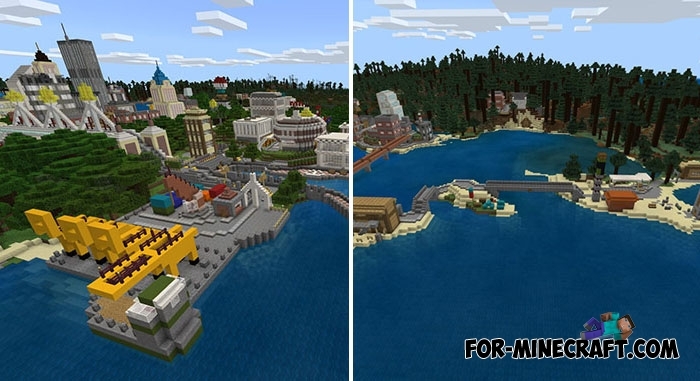 Both cities are developing and supporting Minecraft 1.9.X. High Block State for Minecraft PEHigh Block State is a modern and colorful place of the 21st century where all the attributes of a large..